My darling brother gave me the newest Terry Pratchett novel for my birthday this year. It is “I Shall Wear Midnight” and it was a fun little book. 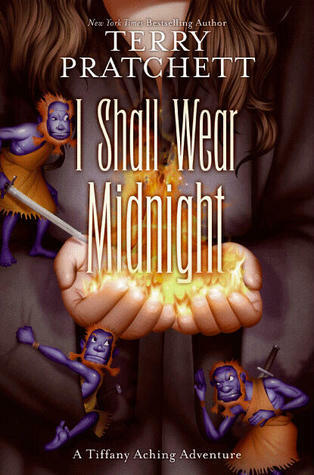 “I Shall Wear Midnight” is the latest in Terry Pratchett’s unbelievably large Discworld series. The series consists (currently) of 38 novels. They all take place on “the Discworld, a flat world balanced on the backs of four elephants which, in turn, stand on the back of a giant turtle, Great A’Tuin.” It is an improbable world (obviously) full of witches, wizards, gnomes, werewolves, and just about any other weird or mythical creature you can think of. I am proud to say that I have read just about the entire series, maybe the entire series. Who can keep track of so many? If you are interested in the Discworld series, you don’t have to start at the beginning. In fact, I believe you could pick up any of them and enjoy them. However, there are a number of series within the Discworld. This book is the 4th in the Tiffany Aching series, within the Discworld series. The Tiffany Aching series belongs within the larger scope of the Witch books. There are also series of books surrounding the City Watch, who are the police of Ankh-Morpork, the largest city on the Discworld. The character of Death has his own story line and series of books, as do the Wizards of the world. All the story arcs are fun. Death and Granny Weatherwax are probably my favorite characters in the Discworld. With that being said, it makes sense that my favorite Discworld books are probably “Wyrd Sisters”, which is a parody of Macbeth in the Witches story arc, and “Soul Music”, which is in the Death story arc and is about the discovery of Rock and Roll on the Discworld. In “I Shall Wear Midnight”, Tiffany is still a young witch who is still trying to find her footing in the world. In the Discworld, witches are in a position of respect. They are wise women who make sure everyone is taken care of and everything runs smoothly. Unfortunately for witches everywhere, something terrible has been unleashed on the world. A creature from long ago that poisons people’s minds against witches. Tiffany must defeat this evil creature before it takes her over and takes down witches everywhere. Luckily, she has the help of many a fun character, including the Nac Mac Feegles, a rowdy group of tiny blue men who love to drink, brawl, and generally cause trouble. They are a terribly amusing bunch of pesky fairies. All the books in the Discworld series are fun. Terry Pratchett writes books full of wit, humor, and charm. He pulls from legend, folklore, and pop culture. This one is no different. It was a fun read and I enjoyed it immensly. It makes me want to get back into the series. Check one out! You really make it seem really easy together with your presentation however I find this matter to be really something which I think I would never understand. It sort of feels too complex and very huge for me. I am taking a look ahead for your next submit, I¡¦ll try to get the hang of it! My spouse and i ended up being so fulfilled that Raymond managed to do his investigation through the entire precious recommendations he came across through the site. It’s not at all simplistic just to happen to be making a gift of key points which often many people might have been selling. And we understand we need you to give thanks to for that. These illustrations you have made, the simple blog menu, the friendships you will assist to engender – it’s got mostly excellent, and it’s aiding our son in addition to our family reckon that that idea is fun, which is extraordinarily pressing. Many thanks for the whole thing! You made a few nice points there. I did a search on the issue and found a good number of folks will agree with your blog. this web site dailly and take fastidious dataa from here daily. this web site is in fact fastidious and the users are truly sharing good thoughts. I definitely wanted to construct a small note to appreciate you for these great instructions you are placing on this website. My incredibly long internet research has at the end been recognized with really good facts and strategies to exchange with my friends and family. I would say that many of us site visitors actually are truly lucky to live in a decent site with many perfect people with great tricks. I feel pretty lucky to have discovered your web pages and look forward to some more awesome times reading here. Thanks a lot once again for a lot of things.